Oil (for the dough) – 3 tsp. 1.) In a paat, mix the whole-wheat flour, cumin seeds, salt and oil with water to make a firm dough. 2.) Divide the dough into 7 – 8 equal sized balls. Flatten each ball and roll out into 3” diameter and around ½” thick. The Jeera Puri is on the thicker side as compared to a normal Puri. 3.) In a kadai, heat the oil for frying on a medium flame. When hot, reduce the flame to a simmer and slide in the rolled out dough, 2 – 3 at a time. 4.) Deep-fry the Jeera puri on a slow flame turning on both the sides at regular intervals. It takes approximately 6 to 8 minutes to fry the Jeera Puri properly. 5.) 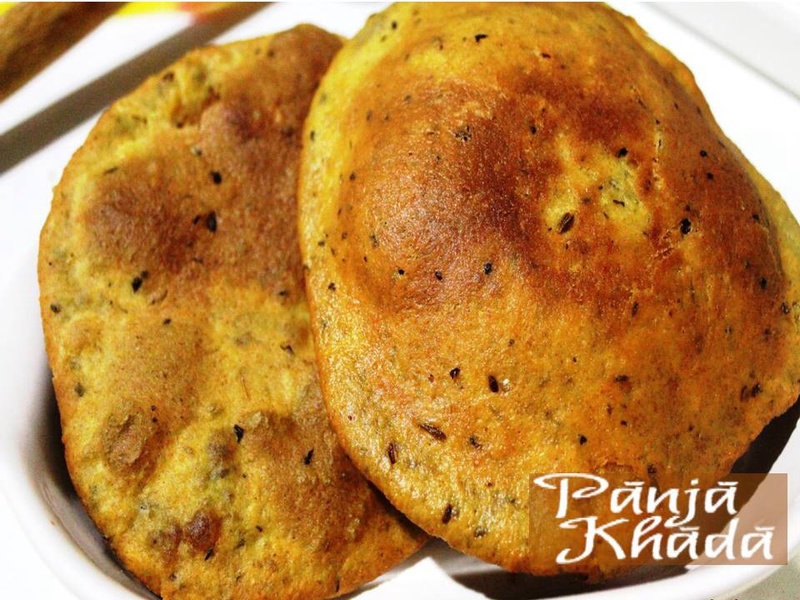 Remove the Jeera Puri when it is light brown in colour and is crisp in consistency. Drain off the excess oil. Jeera Puri can be eaten plain or with fried Pappad and Khummar .It can also be served as a savory with tea. Jeera Puri can also be stored in an airtight container for a couple of days.